Visual Legacy Group - The Product is WinFAST. value in your application software. solution with autoGUI and beyond. 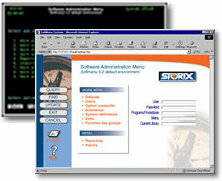 Automated because at the core of our offering is the industry’s most sophisticated and advanced autoGUI technology. Nobody else comes close to being able to do the same level of autoGUI that we do for character-by-character screens. Our unique heuristic AI methodology eliminates the need for manual customization. What others achieve through laborious manual customization, we do automatically. That is what differentiates us from the rest. Accelerated because WinFAST automatically revitalizes “green” screens by recognizing common elements and components within the character screens and transforms them into GUI elements. This autoGUI process is realized using a built-in table of pattern matching templates and corresponding GUI transformations. Unlike other products, ours employs semantic knowledge in recognizing and transforming different host screen patterns. Simple, fast and efficient, it rejuvenates old character-based screens, captured via a telnet session, instantly rendering them as graphical. Due to the level of automation we bring to the process, software modernization projects, which are frequently pushed out due to the inherent cost and risks, become achievable when automating the process. Affordable because the graphical presentation layer that the WinFAST autoGUI creates becomes the foundation for a complete user interface management solution. The autoGUI feature means your application is ready to deploy end-to-end. No need for elaborate plans and schedules with associated costs, timelines, contingencies and the like. There’s no need to hold up deployment while you race to handle each screen in the application. Instead, focus your efforts, over time, in extending and improving the more prominent and heavily trafficked screens. This means you can now stage your deployments, without the dreaded ‘all-or-none’ mandate with other approaches. The bottom line, our autoGUI component sets us apart because it offers real advantages due to the timescale compression. In this business, time is money, and that alone makes a compelling argument for using it.